issues with how the data are analyzed. Whatever the reasons, failure is expensive. In a study published in September 2018 in JAMA Internal Medicine, G. Caleb Alexander, MD, associate professor of epidemiology and medicine at Johns Hopkins Bloomberg School of Public Health, and colleagues, calculated a median cost of $19 million for pivotal clinical trials that supported FDA approvals of new drugs. That’s a fraction of the estimated $2.558 billion cost of developing a new drug calculated in a 2016 study by Joseph A. DiMasi, PhD, and colleagues, at Tufts Center for the Study of Drug Development, and published in Journal of Health Economics. In a February 2018 study in the journal Biostatistics, Andrew W. Lo, PhD, the Charles E. and Susan T. Harris Professor and Director of the MIT Laboratory for Financial Engineering at the MIT Sloan School of Management, and colleagues, last year estimated aggregate clinical trial success rates and durations by indication, using a sample of 406,038 entries of clinical trial data for more than 21,143 compounds from January 1, 2000 to October 31, 2015. The results were sobering: The highest three success rates were 32.6% for clinical studies of ophthalmology drug candidates, 25.5% for cardiovascular drug candidates, and 25.2% for infectious disease products. The lowest percentage came from oncology trials, at just 3.4%. 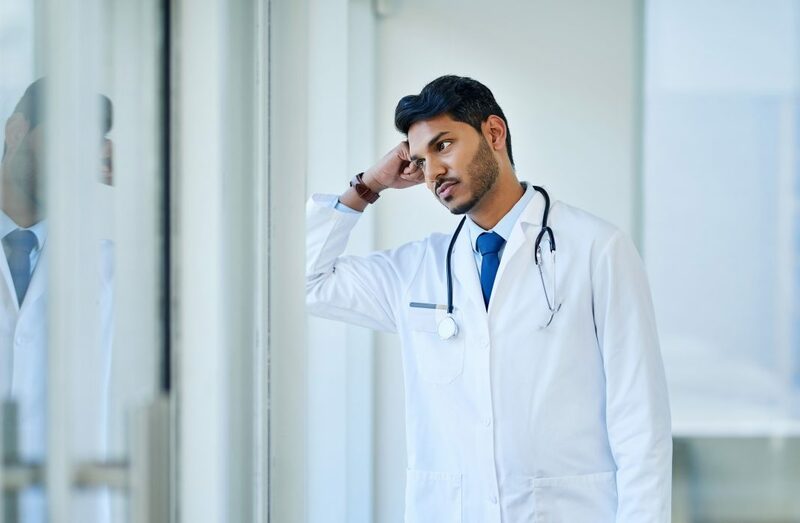 Interestingly, Lo and colleagues recorded a 15% success rate for CNS candidates—even though the category includes investigational drugs for Alzheimer’s disease—which according to a 2014 Cleveland Clinic study showed a 99.6% failure rate between 2002 and 2012. That study found high attrition rates for Alzheimer’s treatments, with 72% of agents failing in Phase I, 92% failing in Phase II, and 98% failing in Phase III. 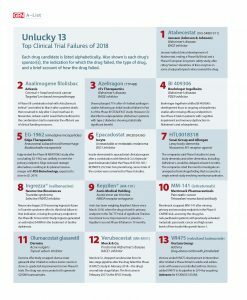 Click on the image to access Unlucky 13: Top Clinical Trial Failures of 2018 pdf. Therefore, it should not come as too much of a surprise that 5 of the 13 drug candidates appearing in this year’s edition of GEN’s “Unlucky 13” list of clinical trial failures were for Alzheimer’s treatments. The next largest category was cancer, which saw three failures make this list. Mere failure in a Phase III trial alone, even with fatalities, was not the sole criterion for inclusion on this list, since numerous drugs fail pivotal trials—sometimes numerous times—before eventually generating enough positive data to garner a marketing approval. Failed candidates making the list touched off a variety of consequences that included termination of development programs, losses in the millions, layoffs, and, in one instance, the resignation of the CEO and other top managers. Also not included were candidates whose development ended last year based on trials occurring earlier. One example is Olita™ (olmutinib), whose development was ended by Hanmi Pharmaceutical in April 2018. A year earlier, the company was faulted by South Korea’s Board of Audit and Inspection for breaking two medical laws regarding its monitoring and reporting of clinical trials after a patient developed Stevens-Johnson syndrome as a side effect of taking Olita and died. According to The Korea Herald, Hanmi also found it difficult to recruit patients for trials because of the success of AstraZeneca’s similarly indicated Tagrisso® (osimertinib). Drug candidates are listed in alphabetical order, along with their sponsor(s), the indication in which the failure occurred, the type of drug, and a brief summary of how the drug failed its trial(s). Johnson & Johnson’s Janssen Biotech halted clinical development of Atabecestat, ending a Phase IIb/III trial and a Phase II European long-term safety study, in May after citing “serious” elevations of liver enzymes in some study participants who received the drug. Shares plunged 71% after vTv halted azeliragon studies following an initial readout failure in Part A of the Phase III STEADFAST study. vTv identified a subpopulation showing statistically significant benefit, Alzheimer’s patients with type 2 diabetes. Boehringer Ingelheim shifted BI 409306’s development focus to ongoing schizophrenia studies after missing efficacy endpoints in two Phase II trials in patients with cognitive impairment and memory dysfunction in Alzheimer’s and schizophrenia. Edge ended the Phase III NEWTON2 study after concluding EG-1962 was unlikely to meet the primary endpoint. Edge reviewed strategic alternatives, resulting in its planned reverse-merger with PDS Biotechnology, expected to close in Q1 2019. Incyte downsized its epacadostat clinical program after a combination with Merck & Co.’s Keytruda® (pembrolizumab) failed the Phase III ECHO-301/KEYNOTE-252 trial. Two pivotal lung cancer trials of the combo were converted to Phase II studies. The companies said Phase II studies in Lewy body dementia and other dementias, including Alzheimer’s, would be delayed at least six months to investigate an unexpected toxicology finding in a single animal study involving non-human primates. Neurocrine began 2019 assessing Ingrezza’s future in Tourette syndrome after its third trial failure in that indication, missing the primary endpoint in the Phase IIb T-Force GOLD Study (NCT03325010). During 2018, Ingrezza generated $409.6 million in net product sales in tardive dyskinesia, accounting for 91% of the company’s total revenue. Auris has been weighing Keyzilen’s future since March 2018, when it missed its primary endpoint in the TACTT3 trial (NCT02040194) of significant Tinnitus Functional Score improvement vs. placebo—Keyzilen’s second Phase III failure in 19 months. Merrimack scrapped development of MM-141 in June after missing primary and secondary endpoints in the Phase II CARRIE trial (NCT02399137), assessing the drug plus nab-paclitaxel in patients with previously-untreated metastatic pancreatic cancer and high serum levels of free insulin-like growth factor-1. Dermira effectively scrapped olumacostat glasaretil after it failed to reduce lesion counts or show 2+ grade IGA improvement in two Phase III trials, CLAREOS-1 (NCT03028363) and CLAREOS-2 (NCT03073486). The drug was once projected to generate $250M in annual sales. Merck & Co. dropped verubecestat from its late-stage pipeline after it failed the Phase III APECS study (NCT01953601) in February—the drug’s second late-stage failure. The first came in February 2017 in the EPOCH study. Vectura ended VR475 development in November after it failed a Phase III trial in adults and adolescents with severe uncontrolled asthma. Vectura added VR475 to its pipeline in 2014 by acquiring Activaero for €130M ($147.6M).